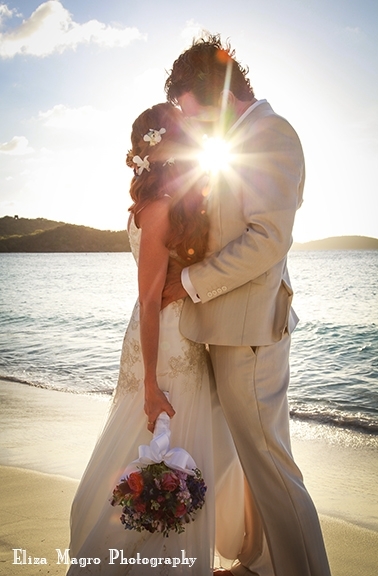 Frequently Asked Questions about weddings on St John Virgin Islands. What is the difference between Anne Marie Porter and the other wedding coordinators? She gives you the information that they charge you for. Anne Marie puts you directly in touch with the people who will be so important on your wedding day (photographer, videographer, florist, musician, caterer, bakery, etc.). This way you can speak to them and their fees are not inflated as they are if booked by other wedding coordinators. How much is your package? 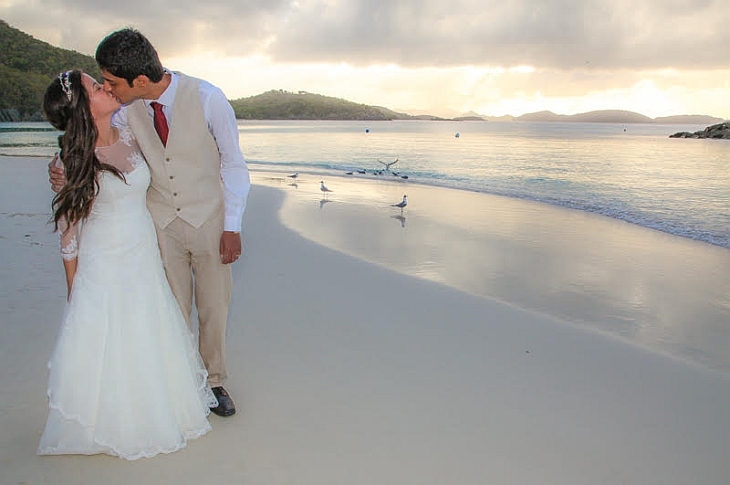 Everything you need to be legally married, in a personalized way, in a gorgeous location. (Officiant, location, witnesses, and two certified copies of the certificate of marriage).It also includes unlimited consultations with Anne Marie and names, phone numbers, websites of any needed vendors (Photographer, videographer, florist, musician, caterer, bakery, etc.). Most importantly it includes personalized guidance by a 33 year resident of St. John who really cares about you. Does the $400 include the marriage license? No, you pay that $200 to the court. When should we pay you? Mail a check today so that on your wedding day, we can focus on the service and celebration. A personal check is fine. You can also go to my home page and pay with Pay Pal. Yes. This is America, and your marriage is recognized worldwide. 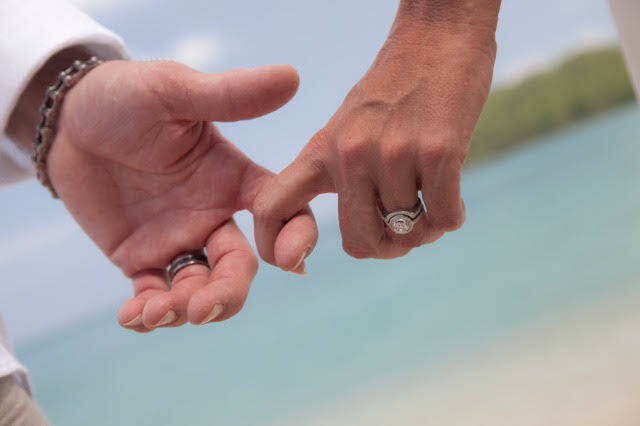 After your wedding, Anne Marie will file your paperwork with the Superior Court and mail you a certified copy of your certificate of marriage. No. 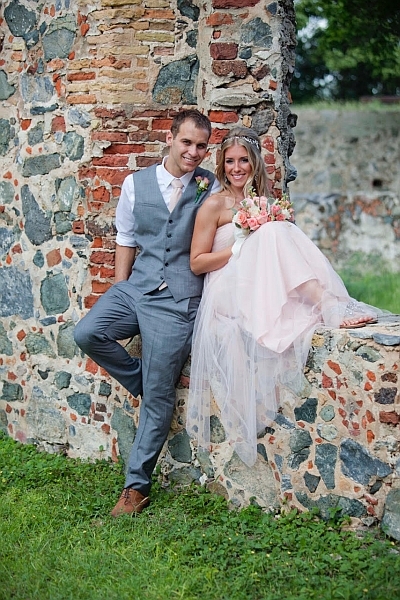 I have already paid the site fees for you to be married on any national park beach or sugar mill ruins. If you want Anne Marie to come to your villa or sailboat for your wedding, there is no additional fee. How long do we have to be there before we can get married? When is the court open so we can pick up our marriage license? The court is open Mon. – Fri. 8:00 a.m. – 5:00 p.m.
Is There A Dress Code When We Pick Up Our Marriage License At The Court? Yes, there is. Do not wear shorts or flip-flops, sandals, or sleeveless dress or shirt. Speak to Anne Marie if you must pick up your license when the court is closed. How do we apply for the marriage license? On the marriage license application where it says “Parents Name” what should we do? Put your fathers’ name first and your mothers’ name below it. Do “Place of Birth” the same way. On the marriage license application, what does “Related to other Applicant” mean? Are you related by blood to each other? I hope your answer is no. What does “certified copy of divorce decree” mean? It means to phone the court where your divorce was issued and ask them to send you a certified copy (stamped with their raised seal) of your divorce decree. This is not notarized, it is certified. Can our certified copy of divorce decree be from vital statistics? Nope. It must be from the court where your divorce was issued and stamped with that court’s raised seal. What if we have been divorced more than once? Do we have to send all past divorce decrees? No, just your most recent divorce decree. Do we sign the marriage license application? Should we have the marriage license application notarized? Do we have to mail both forms – Application for Marriage License and License and Certificate of Marriage? Yes, type in and mail both forms. What is 8-day posting requirement? The marriage license office wants your marriage license application & all required paperwork at least 8 days before you pick up the license. When should we mail our marriage license application to the Superior Court? I recommend one month before you plan to pick up your license. The Court only needs to have your application for eight days prior to issuing you the license but let us be on the safe side. It’s just the two of us. Will you provide witnesses? You’ll get married when it stops, under the rainbow. As soon as you know your wedding date. Will you help us find a place to stay, photographer, videographer, florist, caterer, etc.? Yes, give me a call. Call my cell 340-626-4658. How can we have chairs at our wedding? Chairs are not recommended because they separate the guests from the bride & groom, they interfere with the fabulous photographs, they are not comfortable for your guests and they are an unnecessary impact on our delicate National Park environment. 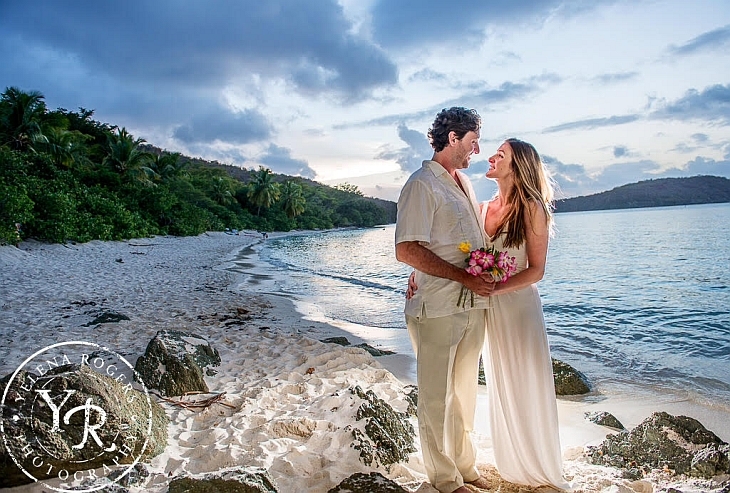 Can we have a champagne toast on our wedding beach? The National Park does not allow glass (champagne bottle) on beaches. You can bring your Champagne and open it in the palm trees and serve it in plastic cups and drink it on the beach. Should we rent a jeep? Yes! 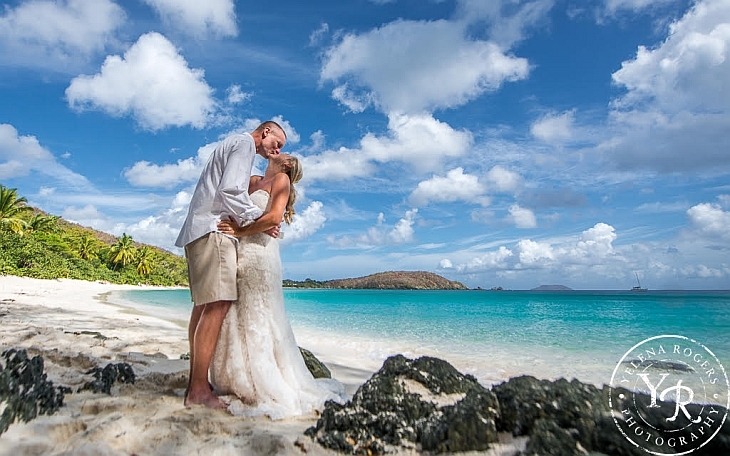 You will have the freedom to explore and really enjoy St. John. In the long run, you will save money by not having to take taxis everywhere. Does Anne Marie prefer phone calls or emails? 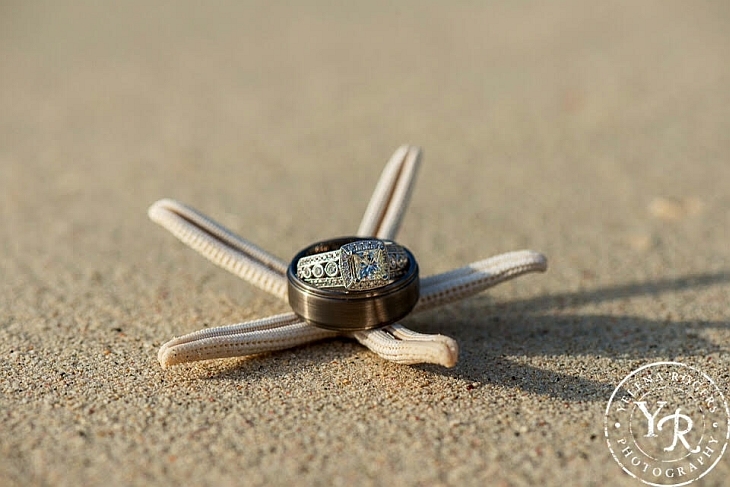 Anne Marie Porter prefers speaking with you about something as important and personal as your wedding or marriage vow renewal service. One phone call can accomplish more than 10 emails. Phone 340-626-4658. What does your $400 package include? All pre-wedding consultations. Phone Anne Marie as often as you like. She pays for the calls. Wedding ceremony at the place and time of your choice. 2 Certified copies of License and Certificate of marriage. Personalized guidance by a 33 year resident of St. John who really cares. What is the difference in what you do and what a wedding planner does? I put you directly in touch with people who will be so important on your wedding day (photographer, videographer, florist, musician, caterer, etc, etc.) so you can speak to them and their fees are not inflated, as they are by if booked by a wedding planner. home page and pay with Pay Pal. In conclusion, the fee of $400 includes unlimited consultations, marriage ceremony at the time and place of your choice, and two certified copies of the certificate of marriage.